As a sports fan, its always fun to see how sports is celebrated in another cities. In the city of Pittsburgh, the devoted fans of the black and gold are everywhere. When was in Pittsburgh, I stayed very close to PNC Park, the home of the Pittsburgh Pirates. I’m not a baseball fan, but I was impressed by the local devotion to the game. Everywhere I looked, locals were happily sporting their Pirates gear (occasionally with some Steelers or Penguins mixed in) before the game started. But for this art lover, it was the unique sculptures of players that surrounded the stadium – especially this statue of Roberto Clemente. 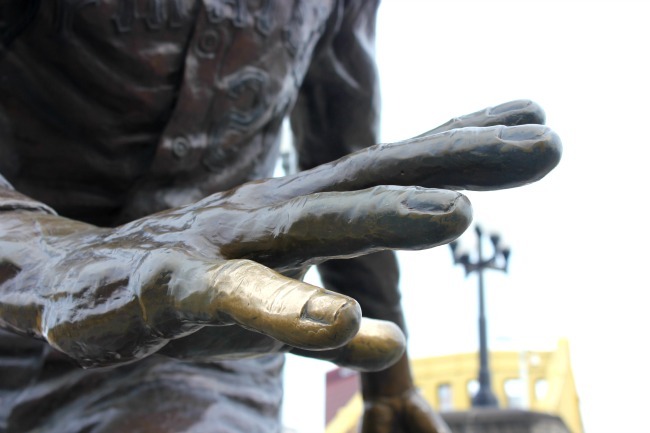 Residing at the corner of Federal Street at the Roberto Clemente Bridge, this lifesize bronze scuplture by Anne Wagner is a favourite of the fans. 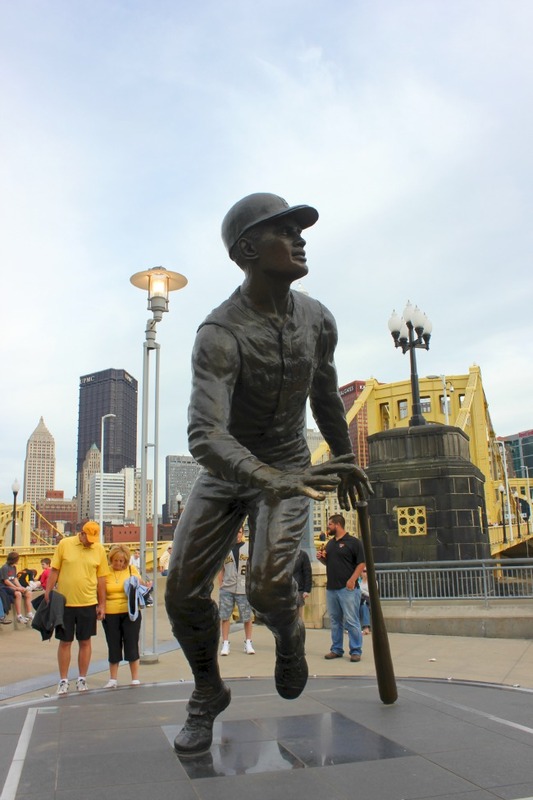 The sculpture of Clemente shows him about to run the bases – with a black granite baseball diamond below his feet. As I watched fans arriving for the game, it was a constant stream of people to come look at the statue and read the inscription at the base. It was another example of how art connects people – as well as shows us history. Clemente died unexpectedly in an airplane crash, and was a favourite player in this city – and although I had heard his name, I learned about him and wanted to know more after seeing this sculpture. I learned that in the base of sculpture, the artist had buried dirt below the bases sourced from where Clemente was born – Puerto Rico, as well as from Forbes Field and Three Rivers Stadium where he played. And although I knew everyone was fixated on seeing their beloved Pirates win the game, I knew the historical sculpture was making an impression on every visitor to PNC Park.